Fire service chiefs in West Yorkshire have branded attacks on their colleagues “despicable” after 19 incidents were reported in the county over the Bonfire Night weekend. The number of attacks on firefighters, most of which involved fireworks or stones being thrown, is nearly double the 2015 total of ten. Both the police and fire service exist to keep people safe and those who think it is acceptable to target the emergency services while they are trying to protect residents can expect to face the full force of the law. 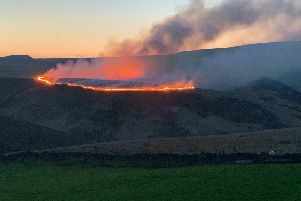 Thirteen of the attacks occurred in the Bradford area, including Keighley, three were in Calderdale, two in Leeds and one in Huddersfield, according to West Yorkshire Fire and Rescue Service. No-one was injured in the attacks, but fire service officials say they are now working with police to gather evidence about the incidents with a view to bringing about possible prosecutions. Between 4pm on Saturday and 8.30am on Sunday, the fire service received 1,043 calls and firefighters attended 265 incidents, including 183 open fires. Chief Fire Officer Simon Pilling said: “It is sad that the actions of the minority reflect badly on what was overall a well enjoyed Bonfire weekend. “Any attack on a firefighter is despicable and to see twice as many as last year on Bonfire Night is a concern to us. We appeal to our partners and the public to make a stand against these attacks and join us in our call for an end to such behaviour. “Fortunately none of our firefighters have been injured but that does not deter from the fact that these attacks were mindless, reckless and completely unacceptable. “We would like to thank Police for their support during our Bonfire Night operation and we will be working closely with them to gather evidence with a view to seeking prosecutions. Chief Superintendent Dickie Whitehead of West Yorkshire Police said: “Bonfire night and the days surrounding them are always amongst the very busiest of the year for West Yorkshire Police and 2016 has been no exception. “I’m pleased to say the vast majority of people attending events and holding their own displays did so in the right spirit and enjoyed themselves in a peaceful and good natured fashion. “Sadly on Saturday night we did witness disorder incidents in which firefighters were targeted and officers attended those incidents to assist colleagues and maintain order. “Both the police and fire service exist to keep people safe and those who think it is acceptable to target the emergency services while they are trying to protect residents can expect to face the full force of the law. “It must be stressed these were the actions of a few and work will be carried out over the coming days to thoroughly investigate what has taken place and identify those who committed offences.